Neil Steede lives in Kansas City. He was educated at Graceland College, Iowa. He attended the University of Missouri and the University of America in Mexico City, where he studied BA and MA degrees in general studies. For 11 years he was employed by the Mexican Government as an archaeologist and in this time excavated some 200 sites throughout the country. He has also worked in an advisory capacity at excavations in Thailand, Guatemala and Honduras. Since then Neil has worked on some 20 sites in the United States, as well others in Canada, Peru and Bolivia. 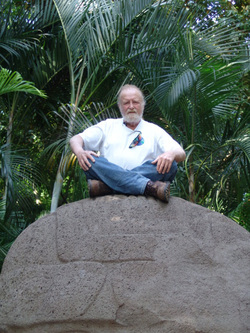 He is a prominent member of the Early Sites Research Society, whose aims are the study of foreign influences on Pre-Columbian cultures of the Americas and evidence of early man on the continent. Recently, he appeared in the NBC documentary entitled 'The Mysterious Origins of Man'.